The 1940 Ernest Hemingway book titled, “For Whom the Bell Tolls” is a Pulitzer Prize-winning (then losing) classic about the brutality of the Spanish Civil War. 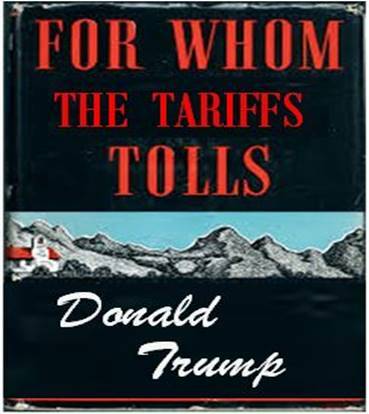 If President Trump were to rewrite this classic novel, the title would change to “For Whom the Tariffs Toll.” It would not be a classic. and wouldn’t win any prizes. On May 31, Trump announced that he was implementing tariffs on steel and aluminium imports from Canada, Mexico, and the European Union, citing national security. National Security? Who should be afraid of whom? The length of the international boundary line of the US/Canada border, excluding Alaska is 3,987 miles (6,416.5 km), which Canada may find difficult to defend. The Canadian military consists of 88,000 personnel, 415 aircraft including 120 vintage fighters, 50-year-old helicopters and 80 tanks. The Navy boasts 63 vessels which include 4 used submarines, bought in 1998, from Great Britain. On the other hand, the USA has 2,083,000 military personnel, 13,362 military aircraft including 5,765 fighter planes and attack helicopters. They also have 5,884 tanks and 415 naval vessels including 20 aircraft carriers. President Trump is right about a threat to national security, but it is Canada and Mexico who are threatened. The implementation of the steel and aluminium tariffs may merely be an aggressive negotiating tactic by the Americans. They do not go into effect until July 1, which leaves 30 days for back-pedalling. Toronto’s Global News reported Prime Minister Trudeau had planned to fly to Washington earlier in the week, to sign a new Nafta deal. When Vice President Pence said the new agreement had to include a “sunset” clause, Trudeau baulked. The prime minister believes that a complicated tri-lateral trade deal would be worthless if it just lasted five years. If the tariffs are grandstanding and a Nafta deal was close, it is conceivable that they will be reversed in short order, at least as far as Mexico and Canada are concerned. The EU is a different kettle of fish, but they are far better equipped to deal with a trade war. Europe prospered for thousands of years before they even heard of America. USDCAD plunged when the deleted word was noticed, falling from 1.3018 to 1.2838. 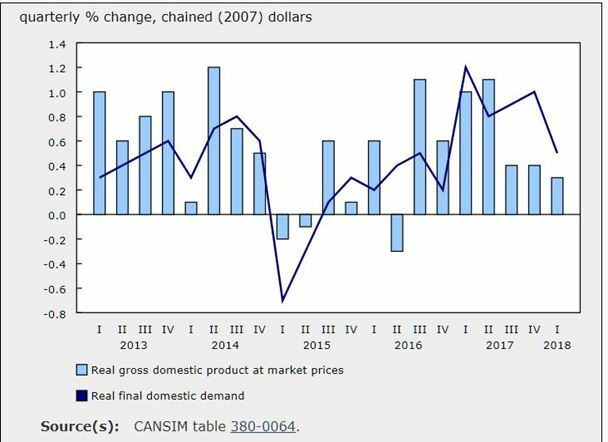 Strategists had visions of 1.2500 dancing in their heads, and all they needed was for the May 31 Q1 GDP data to confirm the economic outlook seen by policymakers at the BoC. It didn’t happen. On May 31, Canada’s Q1 GDP disappointed markets. It only rose 1.3%, missing the forecast of 1.7% and was the third quarter of sub 2.0% growth. USDCAD soared, but the rally stalled just below 1.3000. The domestic data cupboard is bare until the middle of next week leaving USDCAD with a bullish bias and tracking broad US dollar moves. Monday: Traders will likely ignore the G7 Finance Minister meeting communique from the weekend gab-fest. Tuesday: Reserve Bank of Australia policy meeting and statement. FX markets were moribund on Monday because of UK and US holidays. Italian politics dominated trading all week. President Sergio Mattarella’s rejected the pending new coalition government’s choice for economics minister. The pasta hit the fan. EURUSD plunged to 1.1511 from 1.1638. Reuters said that short-term Italian bonds had their worst day since 1992. US 10-year Treasury yields lost 5.31% at one point on Tuesday. By the end of the week, the two leading Italian parties were still working to form a coalition government. President Trump levied tariffs on steel and aluminium imports from Canada, Mexico, and the European Union. USDCAD and USDMXN soared. Thursday was month end. Reports of massive EURUSD buying for portfolio rebalancing purposes proved correct, but the bulk of the move occurred on Wednesday. Wednesday: A slew of US economic reports including Q1 GDP were weaker than expected undermining the US dollar. Thursday: Eurozone May CPI rose 1.9%, well above the 1.6% forecast giving EURUSD a lift. Weaker than expected Canada Q1 GDP lifted USDCAD. US economic reports were robust, led by a surge in Chicago PMI to 62.7 from 57.6 in April. Oil prices got a boost after EIA reported a 3.6 m/b decline in weekly crude inventories. Friday: Japan Nikkei Manufacturing PMI at 52.8 (forecast 52.5) underpinned USDJPY. Eurozone Markit PMI a non-factor. UK Manufacturing PMI beat expectations and GBPUSD rallied. US Nonfarm payrolls surpassed the 188,000 forecast and gained 223,000 new jobs. The unemployment rate of 3.8%, was the lowest in 18 years.